When I was making Sudoku Xtra 10 I wanted to put in a really big Samurai Sudoku puzzle. In the end because I had a square page area available beneath the instructions I went with a 13-grid one (just as a one-off to see what sort of reaction it got!) but I had started off intending to use an 8-grid one. It seemed a shame to let it go to waste, so I’m posting it here. 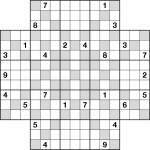 Place 1 to 9 into each row, column, main diagonal and 3×3 box of each of the eight 9×9 grids. 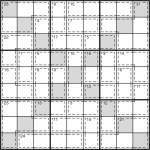 Note that, as in a regular Sudoku, only the rows, columns and main diagonals within the eight underlying 9×9 grids are guaranteed to contain all of 1-9. Any row, column or diagonal not entirely within a single 9×9 grid has no restriction on its content. So best of luck – you don’t need it, but it might help anyway! I haven’t posted a puzzle for a week (it’s been a busy week, mind!) so it’s time to make up for that, just in time for the weekend. In this puzzle the aim is pretty simple: place 1 to 9 in each set of 9 squares starting and ending with a bold line, whether in a row or column, and similarly for each set of 9 squares starting and ending with a bold line in any of the shaded diagonals. I wrote quite a lot yesterday about whether you “needed” the X in some Sudoku-X puzzles. I promised that I’d follow up with the result of analysing a stack of Killer Sudoku-X puzzles, and so here is that result. I picked 64 Killer Sudoku-X puzzles (52 for the daily puzzlemix section plus 12 for the weekly puzzlemix section), and of those about 5 or 6 (I didn’t write it down…) could be solved via reasonable logical deduction without using the ‘X’ diagonals. So that’s roughly 10% of puzzles, if picked at random, that don’t need it. Quite a bit worse than regular Sudoku-X (see previous post), but nowhere near as high a percentage as I’d expected – I had thought it could be 50% or more, although I should say that this isn’t actually a fair comparison because I disabled the cleverest maths-solving techniques from my analysis software. So in fact this is comparing clever Sudoku-X solving against the same Sudoku-X solving with the addition of relatively less clever Killer Sudoku-X solving, so perhaps this biased the result much more to the non-Killer result (from yesterday) than it should have done. But anyway, I’m not writing a scientific paper and it’s good enough for me! PS Enjoy the Killer Sudoku-X I’ve attached here! Just place 1 to 9 in each row, column, 3×3 box and main diagonal, plus make sure the cages add to the given amounts – and don’t repeat a number in a cage. One of the perennial comments on PuzzleMix is that the diagonal ‘X’ regions aren’t needed in a particular Sudoku-X puzzle, or more commonly in Killer Sudoku X. Well, when I say “perennial” I mean to say that of the more than 400,000 puzzle plays that that comment has been made about 10 times. But an interesting point nonetheless. Obviously a regular Sudoku has 9 rows, 9 columns and 9 boxes. Are we annoyed if we don’t “need” all 27 regions? Probably not. But in an ‘X’ puzzle I suppose it’s understandable that you’d expect to use the ‘X’. Now of course there are different definitions of “needing” a region. Strictly-speaking, if you can prove a unique solution via any method (e.g. recursive search) without the regions then you don’t need them. But I decided to define “need” as meaning “you can’t solve the puzzle without them whilst using the standard solving techniques”. Standard techniques are those that Nikoli allow, so everything up to x-wings and hidden/naked quads. Using this definition I looked at 100 randomly-selected Sudoku X puzzles of mine and found that 98 “needed” the diagonals, and only 2 didn’t. Not bad! Of course this result will vary depending upon how vigorously you prune the number of ‘given’ digits in a puzzle. It’s worth noting that not “needing” a region does not preclude it being useful – for example an easy Sudoku-X puzzle may happen to also be a very difficult regular Sudoku, so there is still value in including the regions even if they aren’t strictly-speaking essential. However there are enough Sudoku puzzle possibilities in the world that we can ignore this and simply select puzzles that don’t have any ambiguities. 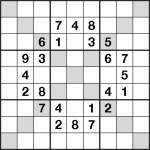 So to celebrate, here’s a Sudoku X to solve. Just place 1-9 in each row, column, 3×3 box and the two main diagonals… but you know that already! Next time I will look at Killer Sudoku X, but with the much heavier constraint of all the extra Killer regions I imagine the X will be needed far less of the time, thus the PuzzleMix comments. So I will be filtering my puzzles in future to make sure the X is always needed! I’ll also be filtering them for extra regions puzzles to make sure those are essential to solving them too.